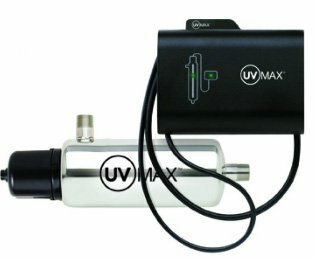 UVMax point-of-use (POU) ultraviolet (UV) water sterilizers are designed specifically to kill harmful microorganisms such as bacteria and viruses in low flow rate water treatment applications. Common applications include treatment of drinking water under your kitchen sink, treating water delivered to fridge water displensers, water fountains, coffee makers, water coolers, ice makers, and other similar applications. The Model B4 is often use to treat water for small recreational cabins where the flow rate does not exceed 4 gallons per minute. Ultraviolet (UV) systems are commonly installed by homeowners who have received a positive coliform, e.coli, cryptosporidium, or giardia water test result, as well as those with reason to suspect that they are at higher risk for such contamination, and those seeking to have peace-of-mind that their water is being properly disinfected prior to consumption. * For most residential applications, we recommend a UV dose of 40 mJ/cm2. All flow rate recommendations are based on this dose and 95% UV transmittance (UVT) and after 9,000 hours of bulb operation.